New Delhi: India’s urban shoppers, attracted by wider choice and more brands than just lower prices, are overwhelmingly in favour of allowing more branded retail chains to set up shop, a sign of looming trouble for the nation’s tens of thousands of small, city shopkeepers. The consumer side of the findings will likely raise an interesting public policy debate as the survey’s main conclusions, reported exclusively by Mint on Wednesday, show that there is a significant decrease in both revenues and profits of India’s smaller retailers. India is currently home to hundreds of thousands of small shops and there has been growing concern that the government’s policies that allowed unfettered entry of branded, large retail chains were likely to have a devastating impact on tens of thousands of shop owners and their employees. But, much like the debate that ensued in India when there was strong opposition to introduction of computers in banks because of the impact it could have on the ranks of public sector bank employees, the debate over the retail policy is complicated because the growth of branded retail chains is also helping modernize an archaic and inefficient retail network through huge private investments that are going into better stores, efficient supply networks, and a much larger array of products and brands for buyers. Still, there is likely to be concern that, much like the policies on special economic zones that were seen as essential for India’s industrial development, but didn’t address the impact on small farmers, the Congress-led government’s retail policy isn’t addressing the fate of small retailers and their employees, essentially the frontline of the nation’s much-vaunted entrepreneurial ranks. Indeed, the Indian Council for Research on International Economic Relations (Icrier) study, which spoke to nearly 1,600 small retailers in four top cities, already shows double-digit sales and profits declines at those retailers in head to head competition with large, branded stores, and a nascent decline in paid employees at small stores. It was precisely such fears—then not yet quantified—that led to a chorus of protests, organized vandalism and small-scale riots against branded retail. This forced Congress president Gandhi to write early in 2007 to Prime Minister Manmohan Singh to ask if the government has fully examined the impact of its retail policy. That public second-guessing then led Singh’s office and the commerce ministry to ask for a national survey, which got under way in March. Some nine months later, there has been no official word on the results of the survey. The scientific survey, done in Ahmedabad, Hyderabad, Kolkata and New Delhi, also spoke to just more than 1,000 shoppers, about half of whom were shoppers at the new, branded chains. Rajiv Kumar, director and chief executive of Icrier, declined to comment on the survey’s findings or give a timetable on when the survey will be released to the commerce ministry. Icrier has had the completed survey for about a month now and it is unclear what is holding up the findings from being made public. Mint has independently ascertained that at least 70% of the surveyed consumers who currently shop at branded, chain stores, such as Reliance Fresh and Subhiksha, want more such stores opened. Interestingly, more than one-third (34%) of those who shop primarily at small, unorganized stores also want more branded stores opened. And, in a sign that small shopkeepers haven’t been able to turn their frequent customers into loyal fans of the small, neighbourhood formats, just a quarter of such shoppers said they oppose opening more branded retail outlets. That is about the same number (24%) as those who already shop at branded stores and would prefer not to have more such stores opening up. Some 41% of those who shop at small stores said they really don’t have an opinion on the issue of opening more branded stores, illustrating that public opinion is still being formed as branded stores start spreading deeper into cities. In a significant finding, the survey shows that large, branded stores are seen by low-income shoppers as providing the largest amount of savings on their daily shopping in relation to similar purchases at unorganized retailers. Those consumers with household income of less than Rs10,000 a month say they have saved, on an average, 10% by shopping at branded stores and say they save as much as 17% when shopping at discount stores. 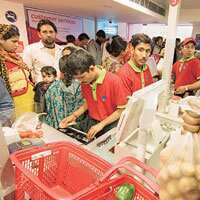 Households with monthly income of between Rs10,000 and Rs20,000 say they are saving, on an average, 7% by shopping at branded retail outlets. These findings—that organized retail helps save money for the poorest of India’s urban consumers—are sure to galvanize big business that supports branded retail and has long argued that their retail stores can provide household essentials such as vegetables and groceries at much lower prices because they are able to buy in larger and more efficient quantities. Many large retailers have also deliberately used low prices on vegetables, for instance, to attract customers into stores with the hope they will also end up buying more expensive—and thus more profitable—items elsewhere in the store. These findings will also put civic and non-governmental organizations, which work on behalf of the urban poor, in a bind as they have often argued for the small retailer on account of possible job losses at such stores in the advent of large, branded stores. But it is also widely documented that India’s urban poor pay among the highest prices for various services, including daily essentials. With organized retail offering significant savings to the poor as suggested by the survey—as well as becoming a growing source of better paid urban jobs for less skilled workers—such groups would be hard-pressed to automatically take up the cause of small retailers. Meanwhile, despite conventional wisdom that lower prices are what will help branded retail, India’s urban shoppers are flocking to such stores for different reasons. Of the top 10 reasons given by shoppers who are opting for branded stores, just two involve either lower prices or sales promotions. Indeed, the top reason given by shoppers for going to branded stores is better quality products (32%), with multiple brand choices (22%), one-stop shopping (22%), newer and fresh products (20%), and wider product range (17%) dominating the list. About a quarter of those who opted for branded stores said discounts and lower prices were a key reason to shop there. By nature, most of India’s small storekeepers will have a tough time competing against bigger chains on many of these consumer preferences because they usually operate out of tiny, overflowing stores where a narrow range of brands and products is piled high in shelves that are only accessible by the storekeeper or a hired hand. At the same time, when the survey asked consumers who prefer shopping at such small stores, a majority (50%) said their main reason was because the store was close to their homes, followed by a relationship or goodwill factor (29%), availability of credit (27%), opportunities to bargain (23%) and lower prices (22%). As branded stores make deeper inroads into city neighbourhoods—Reliance Fresh alone plans 1,500 stores while Subhiksha Trading Services Ltd will have 1,300 discount stores in place by March—it is likely that the biggest advantage that small retailers currently have—proximity to consumer homes—will rapidly decline. Meanwhile, the growing acceptance of credit cards and roll-out of frequent shopper cards, with additional discounts and special sale prices, by branded retailers is also likely to undercut other reasons why consumers currently prefer shopping at small stores. The survey, which talked to some 1,600 small retailers, suggests that they are trying to take the larger stores head-on. Some 60% of those small retailers who face head to head competition from organized retail, defined as a branded store opening within 2-5km radius, say they are trying to make their store display better, with 56% saying they are also trying to increase the number of brands they sell. Still, with sales falling nearly 16% and profits falling by the same measure for small stores that are now competing with branded retail, soaring commercial real estate prices in most urban neighbourhoods and the ability of a Reliance Fresh or a Subhiksha to have significant economies of scale, the survey’s findings offer a tough road ahead for India’s mom-and-pop stores.